Yesterday’s iPhone 3.0 software download from Apple included a new Voice Memos application. 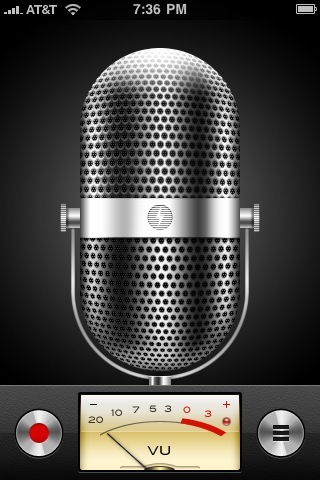 The Voice Memos application allows you to record sound, save it, and email it. 1) Set up a free account with Posterous.com. Posterous allows you to post text, video, big pictures, or audio from remote sources such as your phone. 2) Configure your social networking feeds on Posterous. If you only want to send your voice memo updates to Twitter then you only have to set up the Twitter account. Make a note of your posting email address. 3) Record your Voice Memo using your iPhone. 5) Enter your Posterous posting email. If you configured several social networks, you can just use the “post” email and it will post to all at the same time. I only set up Twitter for now so I will only post to the “twitter” version of the Posterous email. The second time you need to post a Voice Memo from your iPhone, you only need to follow Steps 3-5, and can easily do so while on the go! First, set up your Posterous.com account as in #1 above. You’ll be directed to a screen that will ask if you want to post to your Stream or to your Status. Select your preference. You can also select if you want to post videos to your Facebook Videos. 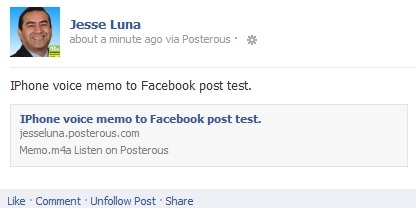 By default, Posterous will post pictures to your Facebook Photos. You can deselect that option if you choose. You should be connected now. Click on the “Add To My Page” link. You’ll see a list of your own Applications, Websites, and Fan pages. Click on the “Add to Page” button next to the desired Facebook page. Go to the bottom of the page and you’ll see your Facebook page in a drop down list. Click on the “Add Facebook” button. You’ll be asked for permission to post to Facebook. Click on the “Allow” button. That should do the trick. Next time you’re on the road or away from you computer, you can take out your iPhone and send over a Voice Memo to your social network. Just make sure you’re not driving, m’kay? I’m always honored to receive your feedback and comments. Let me know if there is anything I can do to improve this blog post or blog in general. This entry was posted in Facebook, Fun, PRO_TIP, Social, Toolbox, Training, Twitter, Web/Tech and tagged applications, apps, Facebook, Facebook Fan Page, Facebook Page, iPhone, Posterous, Share, Twitter, Voice Memos. Bookmark the permalink. Thank you very much for this post! It helped me very much! I got only one problem, when I post a memo on posterous I don’t get the same the same result as you have in your picture. I only got a link to listen to the memo on my posterous page (people quit my wall.. they can’t listen to it straight from it) Do you have any advise? VADIM.- Hi, Im getting the same results as you. I want to just get that neat play button on facebook. Did you find out how to set it up. Thanks for your help. I know Jesse Luna coudnt help. Plz advise…any update on posterous? http://www.posterous.com/ This web page doesnt exist any more.